Lincoln Brick Park may contain only 90 acres and less than 3 miles of trails, but acre for acre it’s as scenic and historically interesting as any park in central Michigan. The park’s name comes from the Lincoln Brick Company, the last of five companies that made bricks here for more than a century until 1949. In the center of the park you can still view the remains of the brick factory’s original boiler room, the warehouse where sand was stored, and a kiln that in its heyday was capable of producing 40,000 bricks a day. 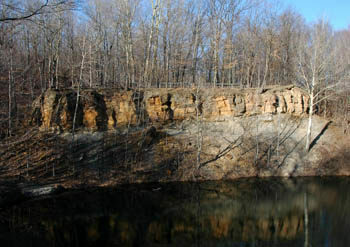 Most of Lincoln Brick is composed of heavily wooded bluffs that border the park’s most dominant feature; more than 6000 feet of the Grand River, Michigan’s longest river. 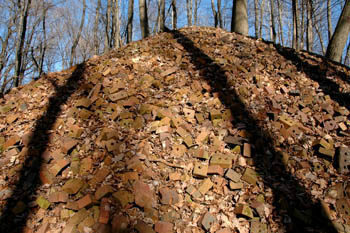 Scattered through the woods are numerous reminders from the park's brick-making days; pieces of corrugated iron, a small brick-line oven, even a mining cart that was used to carry shale up from the quarry. Upon close inspection you’ll discover many of the small hills along the trails are actually piles of discarded bricks with reddish chunks still poking out from between the leaves. You make 40,000 bricks a day, you're bound to have a few bad ones. Lincoln Brick is explored by a series of nine short trails that are will marked and easy to follow. 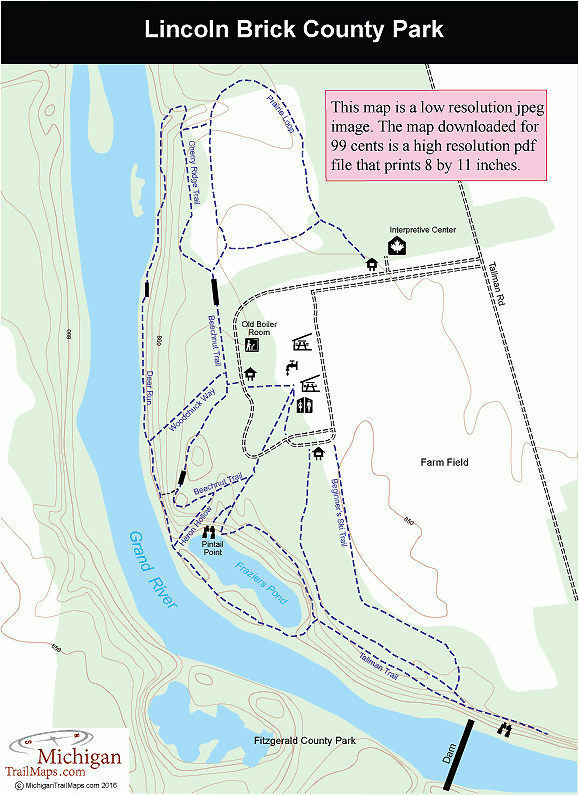 The only ones that form loops are the Beginner’s Ski Trail and Prairie Loop that winds through a restored prairie. Both are 0.6 mile long. The longest and most interesting trail is the 0.8-mile Deer Run that skirts the banks of the Grand River so close you could fish from it in places. The best hike is a 2.2-mile walk that combines Beechnut, Cherry Ridge, Deer Run, and Tallman Trails. Mountain bikes are not allowed on the trails and this would be a difficult route to ski in the winter. But if there is sufficient snow, snowshoeing would be an excellent way to explore these trails. Lincoln Brick has two picnic pavilions in a pleasant wooded setting along with vault toilets and drinking water. Nearby there is a small playground. The park also has an interpretive center with a museum and a classroom available for rent. The small museum area features a display on the history of Lincoln Brick Park and has a large collection of fossils and rocks from all over the United States. Lincoln Brick Park is open daily from 8:00 A.M. to dusk. The interpretive center is open Thursday, Saturday, and Sunday afternoons from 1 to 5 p.m. during the summer. A motor vehicle entry fee is required from April through October. The park is just west of Lansing. Depart I-96 at exit 86 and head south on M-100 (Wright Road). Turn west on State Road for a mile and then drive south a mile on Tallman Road to the entrance. Contact Eaton County Parks and Recreation Department (517-627-7351; www.eatoncounty.org/departments/parks-department).